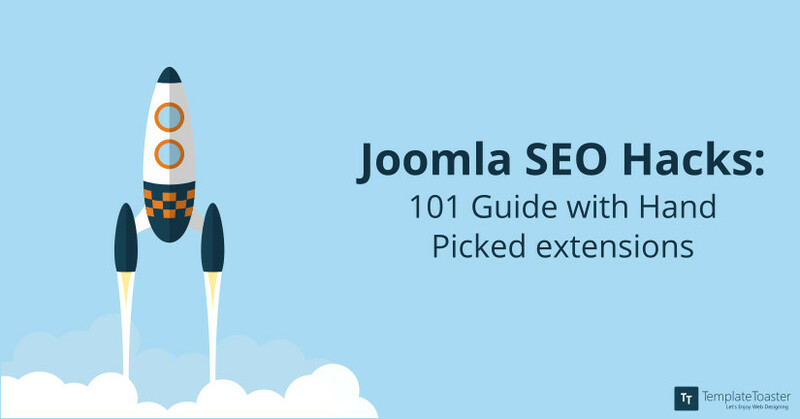 Guides address a problem for sure, but this 101 guide will lead you to solutions to fully optimise your Joomla website by using our tried and tested top Joomla SEO extensions. SEO, Search Engine Optimization, serves a key role in improving your website’s’ ranking in SERPs. Hence, the more we focus on the SEO factor, the better the platform is. These SEO extensions when incorporated can prove to be quite helpful. You are required to combine them well, in order to bring positive results for your website. There are some essential SEO constraints that are worth discussing. Here at Templatetoaster Joomla template creator, I’m going to provide you enlist these. It is to keep in mind the importance of meta tags. These include Meta title, meta description and all the significant meta data that holds importance from the SEO point of view. Page Title holds the utmost importance of any page. Any reader would first notice that only. And after that, Meta Descriptions. The aim is to get on the top of the links that roll on the main page. These links are highly influential as they are gonna decide if the reader is going to click on it or not. People tend to only focus on the title and not the Meta Description. Including necessary keywords in your content which are most searched is an essential part of Joomla SEO optimization. The keywords which have more searches can lead you to the top of the search page. This is one of the most underestimated parameters that comes under SEO. Providing links from within is as important as linking externally. There are times when even Google appreciates this activity and identifies the important pages of your site. The pages that are already existing can bring you more traffic. This will enhance your optimization level. Let’s face it, clustered links look highly unattractive. And no reader would want to open it. For URL optimization, one should know the importance of search engine friendly URLs. These are the ones that are readable and understandable. They possess a higher chance of topping the links page. This is beneficial for your Joomla website and for Google as well as humans. The social media world has been rapidly evolving. Google keeps a tap on the latest trends and searches that go viral on these platforms. Hence, building a strong social media front can help you achieve a greater audience. Google keeps account of these things as well and it can enhance your site’s overall ranking as well. When you are migrating from old site to a new site, you will automatically be provided with a new URL. But the users who had the older URLs bookmarked will be redirected to the older URL only. Therefore, it is important to reroute them to the new ones. 301 Redirect is the one that can assist you in such cases and bring you Joomla SEO optimization. Joomla is a typical CMS which can make the same article have multiple reaches due to many menu items. Along with that, trail slashes, pages ending with index.html, index.PHP, etc can lead to duplicity in URLs, ultimately leading to Content Duplicacy. This particular constraint brings awful results. For Joomla SEO development, this situation must be avoided. This server configuration file is like the foundation to your website. With access to this file, one can easily improve many issues like 301 redirects, non SEO friendly URLs, etc. If one can edit this file, one has an upper hand in this Joomla SEO rat race. A sitemap is a page that provides an overview of all the pages available on a site. It aids in navigation and provides improved visibility in search engines. It also indexes the pages faster. And it even fixes cases of crippled internal links and strayed pages. One can call it a top notch Joomla SEO hack. Avoiding error 404 is highly mandatory for it is bad from SEO point of view. When an Error 404 page appears, the users usually leave the page since they consider the site broken. This diminishes the SERP ranking of a site. And both Google and users hate this because it represents a bad website linking. While your content is being processed, adding tags to it brings a finesse to the overall look of your page. These tags are two-way roads. From Google’s perspective, it becomes easier to index. And the certain category is generated for the reader to access the content accordingly. It is one of the most underrated methods while maintaining Joomla SEO. There are certain Webmaster tools that can show you any errors with your Joomla site. They can aid in setting site defaults, managing site links, and analyzing meta descriptions. It also informs if the website has issues of site maps, duplicate title and description, 404 errors, and malicious content. This tool is highly recommended for your Joomla SEO progress. Robots.txt configuration file possesses information regarding the websites, which one wants search engine bots to crawl or not. For combatting the SEO constraints, we are suggesting you certain Joomla SEO extensions. Some of them are feature-specific as well. These can be used in a combination for fulfilling SEO prerequisites. These plugins have been tested hence, we assure that the suggestions will definitely bring better results. a) JoomSEF: This plugin has the option for Meta tags wherein, further options are provided for Title and Meta description. Support: 100; Functionality: 100; Ease of use: 100; Documentation: 100; Last update: Jun 28, 2017.
b) Tag Meta: With an abundance of options to customize Meta details. This plugin can even provide you an option of Custom Meta Author, Copyright and Meta Generator. Support: 100; Functionality: 100; Ease of use: 100; Documentation: 100; Last update: May 08, 2017.
c) EFSEO: This plugin provides special SEO settings targeting Metadata only. It has options for URL, Title, Generator, Description, and Keywords. One can easily change or edit such meta information like Title, Description, and Keyword from one place. d) Title Manager: This SEO plugin provides you an option to modify Site Name/ Page Title Layout. And other options like, Title Separator, Alternative Site Name. One can even customize Home Page Title with it. Support: 99; Functionality: 99; Ease of use: 99; Documentation: 92. Readable.io: This tool can assist you in checking readability. It even offers the feature to refine content by analyzing your text and telling you about its quality. Internal links: This plugin offers an exclusive feature to add internal links to your website’s articles, sections, category etc. Support: 43; Functionality: 43; Ease of use: 93; Documentation: 43; Last update: Apr 19, 2016. JoomSEF: This SEO extension is named as highly “URL search engine friendly”. It provides several options for URL optimizations like URL management, duplicate URL customization, URL caching etc. Support: 92; Functionality: 83; Documentation: 87; Ease of use: 78; Last update: June 2nd, 2017. JoomSEF: This SEO extension combats the issue of 301 redirections. One can easily transfer old link’s reputation to the new one by using the option Manage 301 redirect. JoomSEF: This exclusive feature is provided only in its paid version. Yet, this gives the advantage of handling the SEO related issues. Link with Article Images on Facebook: This Joomla extension adds invisible Open Graph tags in HTML code with images and page details. It does so only when there is no image to be found in the article. Support: 100; Functionality: 91; Ease of use: 100; Documentation: 100; Last update: Nov 04, 2016. JoomSEF: This particular plugin even offers the option to configure Canonical links. Tag Meta: This Joomla extension helps in customizing metadata details. It even provides the option for Clean Canonical link to solve the issue of content duplicity. OS map: This plugin can be used to generate XML sitemap, Image sitemap, and HTML sitemap. Support: 89; Functionality: 92; Ease of use: 92; Documentation: 96; Last update: May 09, 2017. Webmaster Site Verification: This SEO extension provides efficiency in the website verification process done by Webmasters. You are only required to add your Id and publish this extension. Support: 96; Functionality: 98; Ease of use: 98; Documentation: 98; Last update: Oct 15, 2016. EFSEO: This Joomla plugin provides SEO settings mainly targeting Metadata. It has options to add, URL, Title, Description, Keywords, Generator and Robots. The Robots option further provides a category to index, follow not. We recommend JoomSEF for Metadata, URL structure, and duplicity, 301 redirections, .htaccess file and building Canonical links. Webmaster site verification can be used for Webmaster integration. OS map is there for solving Sitemap issue. In order to maintain Open Graph Tags, Link with Article Images on Facebook is available at hand. Internal links is there for Internal link suggestion. And, Readable.io tool is there for Keywords. Apart from that, for Robots.txt, you can use this tutorial to edit the file manually. It is an easy process and no further complications are to be expected. We have tried out these plugins to combat issues and aimed at improving the website from the front end. For every specific pointer mentioned above, we used JoomSEF as this plugin is multi-faceted. It has features like Custom manage URLs, Handle Meta Tags, edit .htaccess file, Configure canonical links etc. Even the Error 404 page can be customized and managed as well. Along with that, other plugins like Tag Meta could be used specifically for Metadata and avoid content duplicity. Title Manager can be used for Metadata as well. EFSEO offers an option for Metadata as well as Robots.txt. We used these plugins and they could easily suffice to the SEO needs of our Joomla website. And not to forget, there was a significant difference when it comes to Search Engine Optimization. We have tested these extensions along with each other and none of them acted funny which was surprising at first. But it deserves to be applauded as this can bring a stock full of optimization. Joomla websites themselves provide SEO configuration to harness the competition. If you make use of these SEO hacks, it holds close proximity to making your website SEO friendlier. As they say, the more, the better. Similarly, in the case of websites being SEO friendly: the friendlier, the better. These SEO hacks should definitely be amended at first when you are planning to create a Joomla Website. On a similar note, a site’s loading speed holds as much contribution to SEO as any other pointer. And frameworks impact the site’s speed directly. Thus, choosing the right framework is of high importance as it should be able to support your hefty content and website efficiently. TemplateToaster is the perfect website builder and web design software here, as its themes accord with Joomla extensions as well, hence, making your designing process so much easier. Therefore, design your Joomla website effortlessly and see these SEO hacks doing wonders for you.